뉴욕, 미국의 재즈 온 더 파크 유스 호스텔 | 호스텔월드에서 예약하세요. <li>Changes can be made without penalty 14 days prior to arrival. <li>No refund will be issued for cancellations received less than 7 days prior to the date of arrival. Sports groups need to have a group leader or chaperon. Jazz on the Park Hostel is the flagship hostel of the Jazz Hostels chain. Since 1998 we've offered a social, relaxed and safe environment where budget travelers can meet other guests while enjoying all that New York City has to offer. Jazz on the Park Hostel is conveniently located in the hip Upper West Side, along the northwest side of Central Park and three short blocks walk to the B & C subway lines. In addition the many shops, restaurants and bars just five minutes away, nearby attractions include The Museum of Natural History, the New York Historical Society, Cathedral of St. John the Divine (the world's largest Gothic Cathedral), Riverside Park and Grant's Tomb, Columbia University, and the Hungarian Pastry Shop. Take a walk across Central Park, and you'll find yourself on 5th Avenue, on the doorsteps of the Metropolitan Museum of Art, the Guggenheim Museum, the Neue Gallery, the Jewish Museum of Art, and other major NYC landmarks. 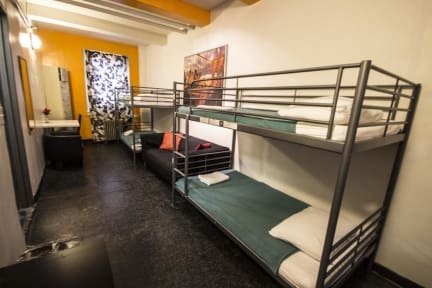 At Jazz on the Park Hostel we can accommodate both groups and individuals in single, double, or dormitory style rooms. Shower and toilet facilities are centrally located on each floor. Lockers are provided in each room for personal items, But please note that you must bring your own padlockone. We also offer free linens and towels; no curfew; a sensible drinking policy; A/C in all rooms; 24-hour reception, security, and access to Internet kiosks; a tourism booth (at select times); and a friendly multi-lingual staff to help make you feel at ease. We also best known for our funky coffee bar/TV lounge, and summer pub crawls and BBQ parties where everyone is guaranteed to eat well and make new friends.WIFI available for FREE in our common areas ONLY. So, whether you've heard about us from a friend or came across us on the internet, make sure that you don't pass up the opportunity to experience Jazz on the Park. Come check us out, we're waiting to meet you! Though we make every attempt to do so, we cannot guarantee that everyone in your party will be able to stay in the same room. Room allocations are made based on availability and on a first-come first-served basis. Total Cost DOES NOT include taxes or fees. In New York, hotel and state tax is 14.75% plus a $3.50 service fee for each bed booked. These amounts will be added to your total bill and will be charged upon check in. Cancellations or changes must be notified to the hostel at least 48 hours in advance via phone or email. In case of a 'NO SHOW,' a total of one night will be charged. Sorry, NO NY STATE Residents. I was little bit worried about jazz hostel. becase some bad reviews. but it was very nice. they were friendly staff and nice location and and price. And they have some activity. You can join with them and make a traver. 스텝분들도 정말친절하구 편안한 분위기입니다. 하루있다가 다른 곳으로 사정상 옮겼지만 스텝분들이 다른날 있는 이벤트도 오라고 초대해주고 친절해요. 하지만 같이 클럽이나 펍가는거 생각보다 별로인곳가니..기대는 안하시는게 좋습니다. It was good to visit. The hostel is located just near by central park. Bright. And Mr. Manager Jose was quite nice, gentle and helpful. Good to visit for consider your budget and traffic. Staffs were very nice and kind. Location was not bad for me, but it might be too 'North' for downtown-travelers. 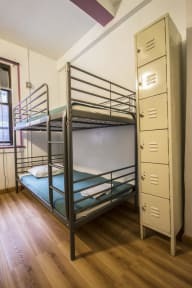 Everything else is not bad but the atmosphere heavily depends on the travelers who use the place, since this hostel can accompany up to 74 people.